A fire risk zonation map of Vientiane was compiled under the People’s Democratic Republic of Laos (Lao PDR) Urban Disaster Mitigation Project (LUDMP) for fire prevention, mitigation and preparedness at national and city levels. During this attempt, Ban Hatsady village was selected to undertake a community-based fire risk assessment process. 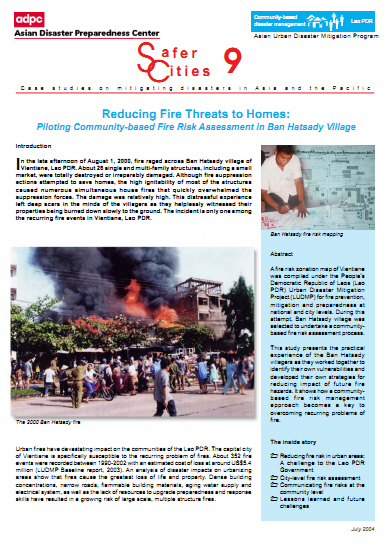 This study presents the practical experience of the Ban Hatsady villagers as they worked together to identify their own vulnerabilities and developed their own strategies for reducing impact of future fire hazards. It shows how a community-based fire risk management approach becomes a key to overcoming recurring problems of fire.